You nailed the interview, negotiated a nice, fat salary and completed the HR paperwork. Congratulations on the new gig! Good on you! But in all the excitement of your new job, don't forget about your old 401k! Take the money…pay Uncle Sam 50% in taxes & penalties… and run! Just because it's an option doesn't mean it's a good one. Obviously, taking the money out and paying taxes on the whole thing PLUS a 10% early withdrawal penalty (if you're younger than 59.5) is a terrible idea. 401k's are great for saving, but they are TERRIBLE for investing. Each 401k plan is different, but even the most robust 401k's offer only a limited number of funds to invest in. You're options are limited to whatever Human Resources has picked out for you. So you're forced to pick the best of the mediocre and call it a day…until you leave your company. Once you leave, you can roll your 401k into an IRA - Individual Retirement Account. It's tax-free and penalty-free to do so. More importantly, once it's in your IRA you can invest in pretty much anything you want. Instead of picking from the best of the mediocre, you can pick from the best of the best! Woohoo! Then you can invest in a well-diversified portfolio of low-cost index funds, which is how you should manage all of your "serious money". And what's more serious than your retirement savings!? Then as you progress throughout your career and get better and better jobs, you consolidate all of your old 401k's into the same Rollover IRA. If you have old 401k's laying around, we'd be happy to help. Check out our website - www.financialzen.com - and if you like what you see, schedule a free initial consultation. Disclaimer: This information is for educational purposes only and should not be considered advice or a recommendation. Speak to your financial advisor for help with your specific situation. 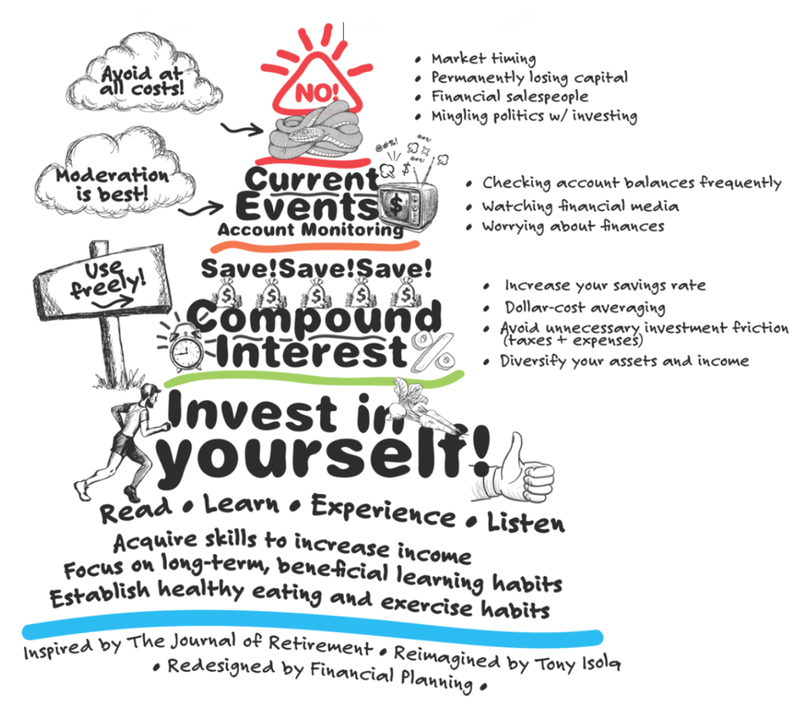 Courtesy of Financial-Planning.com. Couldn't have said it better myself. …the more you handle it the less you have. The unspoken secret to long-term investment success is…ironically…to do nothing. Buy...and then hold. Wall St. doesn't want you to know this. Wall St. doesn't make money if you buy and hold. They make money from the transaction fees you generate for them when you buy and sell and then buy and sell again. If you truly want to beat the system, don't try and beat the system. Your future, happily retired self will thank you.